The Quins put a frustrating run of matches well and truly behind them at the Gnoll with a fine bonus point victory and five well taken tries. The doomed All Blacks in fairness put up a spirited resistance and always looked to move the ball when in possession, but all their efforts were dented with well drilled Quins tackling. The early minutes set out the pattern for the afternoon as both sides were bent on moving the ball, to the admiration of the decent crowd. A Neath passing bout was intercepted near the half way to put Dale Ford away on a 50 meter run in under the posts after 10 minutes for Aled Thomas to convert. Almost from the re start the Quins powered up field and after a series of mauls, gained possession for three players to handle to find Aron Hemmings free to cross near the posts. Aled Thomas slotted the conversion. The Quins line out was back to its competent best taking play up to the 20 minute mark before the All Blacks got into the Quins half and gain a penalty which Jordan Rees converted. Pressure from the Quins eight took play into the home 22. From a set piece five meters out, the home side expected a Quins push allowing Aron Hemmings to catch them out and he darted away from the scrum to cross for a clever try, Aled Thomas converted. Richard Bloomfield, back from injury, was having a field day and was supported by Ed Siggery and Javan Sebastian, giving the home eight little chance of getting out of this stranglehold. With the second period barely a minute old a clever kick out wide found space for Jon Bayliss to run on to and go over in the corner only to see the conversion sail well wide. This was answered by Aled Thomas on target with a 44th minute penalty. 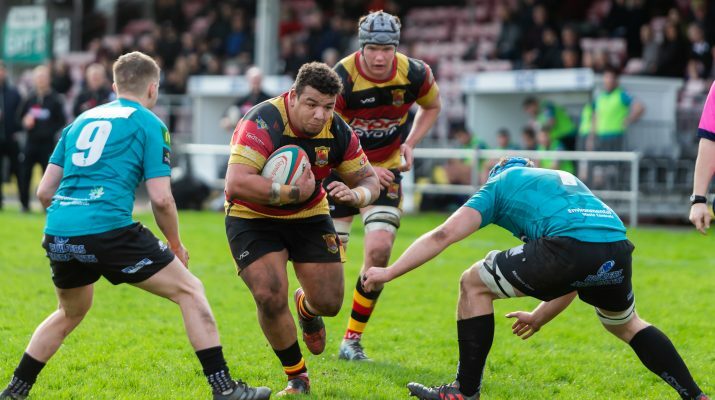 With a bonus point on the table, the Quins were all out to oblige and after a series of attacks which took play up to the Neath posts Hemmings switched play to his left and the overlap gave Torin Myhill space to go over in the corner, for the well deserved extra reward, Aled Thomas was on hand with the kick. The All Blacks heads were down and this enabled Aled Thomas to weave his magic and go over for the Quins fifth try and he moved his Match total to 13 with the kick. The Quins were in rampant mood and some exciting running deep into injury time saw Dylan Morgan break away only to see his pass back inside caught by the Neath cover and they started a counter attack which caught the Quins flat footed and result in Callum Hall crossing for a consolation try to end the match.